Rep. Paul Ryan talks to media April 1, 2008, about his budget plan. 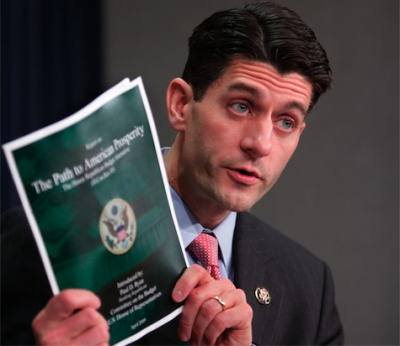 Ryan wants to privatize Social Security. Photo by AP. The Lafayette, Indiana, Journal and Courier, a Gannett Newspaper, printed an Associated Press story, Monday, August 13, on the front page above the fold, entitled “Little Security for Program’s Payouts.” It warned that Social Security would be in financial crisis by 2033. The story reported projections of Social Security shortfalls of $7 trillion by 2086. And if 75 years of shortfalls are added up, adjusted for inflation, that would amount to $30.5 trillion dollars. By my calculation in today’s dollars that would reduce the feasibility of engaging in 10 Iraq magnitude wars! Before readers, particularly the young, freak out after reading this story, they should access on the web a report entitled “A Young Person’s Guide to Social Security” from the Economic Policy Institute study prepared in collaboration with the National Academy of Social Insurance. The report summarizes the history of Social Security, its goals, its payment structure, and the long-term projections of its economic stability. The Social Security program has been the most cost-effective program ever developed by the United States government. Less than one percent of payments into the program are used for its administration. The Social Security program is an insurance program paid for through payroll taxes workers and their employers pay in equal proportions. The Social Security program provides benefits to participants who have paid into the program for at least 10 years. Those entitled to benefits are retirees over 62 years of age, persons with sustained disabilities, and orphans and widows of insured workers. Without Social Security half of America’s senior citizens would live in poverty as opposed to the one in 10 who are in poverty today. From 1959 to the present the percentage of the elderly who lived in poverty dropped from over 35 percent to nine percent. Even though the U.S. economy has experienced multiple economic crises since the foundation of Social Security, payments to eligible recipients have never been postponed or arrived late. Social Security is funded by “dedicated revenue sources” -- that is, payroll taxes, interest on the trust fund, and taxes on high income earners who are also social security recipients. The EPI/NASI report lists possible policy changes that could address the temporary shortfalls in Social Security receipts that may occur at various times between 2033 and 2070. These include raising the payroll tax rate, raising the “tax cap” so James pays more on his $16 million salary than those earning a tenth of his salary, or extending the pool of workers -- such as some state and local government employees -- who would be eligible and thus contributors to the program. In addition, social security statisticians point out that the spike in upcoming social security recipients, the so-called “baby boomers,” will flatten out with declining birth rates. The addition of Congressman Paul Ryan to the Romney ticket is cause for the rekindling of the far-right agenda to privatize social security, which, given the recent economic crisis, would have been a disaster for millions of senior citizens. Former President Bush had proposed the privatization of Social Security in 2005 but withdrew his proposal because of massive public resistance. Media conglomerates including Gannett, the Associated Press, and their home town affiliates, have been ready and waiting to scare the American people again. And, like Iraq’s alleged “weapons of mass destruction,” this new campaign is designed to overcome the overwhelming resistance of the American people to changing the most successful U.S. government program in history. And the targeted population is young people who the Right wishes to set in conflict with their elders. Of course, the fear merchants will not raise the specter of young people, jobless and poor, having to support their elders who may slip into poverty because their loved ones no longer have insured retirement benefits. It is a scary prospect for young and old alike. All the more reason for building a progressive coalition to fight the right-wing assault on Social Security, Medicare, Medicaid, and all the other programs that help everyone but the one percent.